Mining security and safety has become a critical focus area across Africa. Today it is directly linked to production targets, and ultimately profit. One of Africa’s greatest safety challenges is illegal miners who do not understand the potential hazards on site, and as a result find themselves in safety-compromising situations. Secu-Systems offers mines a security solution that guarantees a significant reduction in illegal mining activity, specifically in the open cast mining sector. Secu-Systems was established to provide high-end turnkey solutions for the mining sectors, ports and harbours and border controls. Its robust, mobile and advanced security solution, named Spotter, allows companies to overcome perimeter breaches quickly and with the least danger to employees. Spotter has already proven itself in three of the world’s largest gold producers – at mines in Tanzania, Guinea and South Africa – and can deliver similar safety/security benefits to any open cast mining facility. Once the Secu-Systems solution was installed and operational on site in Tanzania, the results were immediate, revealing the staggering numbers of illegal miners entering the site on a daily basis. This has enabled the mine to implement a process to find and remove these miners from site immediately. 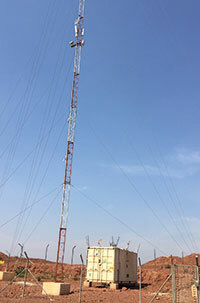 The Spotter security solution is designed specifically for remote regions with no supportive infrastructure. It is based on a standalone, self-sustaining ‘green’ system comprising a wireless, mobile 20-foot container which securely houses all peripheral intrusion and detection equipment. This includes external, passive infrared detectors; high-pressure pepper systems that trigger on activation of the security systems or can be remotely detonated upon verification, as well as FLIR thermal cameras that can detect motion within a 6 km radius from nominal ground level. The military-specified container solutions are fitted with their own power reticulation, which includes solar panels mounted to the roof of the container and battery banks installed within the container. Security systems are integrated with the camera solution and include wall-top and/or additional freestanding electric fencing with energisers operating off the internal power reticulation. All sides of the container are equipped with nozzles and high-pressure hydraulic piping. The includes wireless communication back to a centralised control room (as long as line of sight can be attained). The streaming cameras can easily detect movement in as little as four pixels. 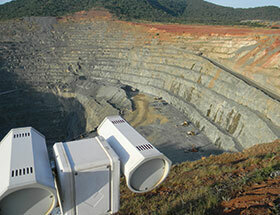 Moreover, where conventional perimeter intrusion detection systems (PIDS) detect intrusions at the perimeter only, Spotter can track intruders from the perimeter and throughout the mine. With high-powered, single PTZ thermal cameras placed on high sites, intruders cannot hide and are followed throughout the location until removed, thus giving management complete 360-degree situational awareness and peace-of-mind.